Grilled Bang Bang Shrimp Skewers – Grilled shrimp skewers covered in a spicy, creamy, sweet chili sauce. Perfect for the summer barbecues! It’s grilling season! Who’s been grilling up a storm so far?! I have!! Grilling is my FAVORITE, especially because of the amazing charred grill marks that add so much flavor. Yummmm. Today’s recipe is brought to you by the spectacular grilling machine, otherwise known as a grill. Check out these yummy Grilled Bang Bang Shrimp Skewers! Have you heard of Bang Bang Shrimp before? They are a fried shrimp appetizer that are coated in a creamy, spicy sauce that gained popularity from an upscale seafood restaurant chain. I credit these shrimp for getting me to like spicy foods. See, fried foods can change the world! Since frying at home isn’t my favorite AND I just love grilling so much, I transformed this recipe into grilled skewers. And they’re extra healthy because they don’t have the breaded coating. But don’t worry – they still have the same creamy sauce covering every square inch. To make these skewers, all you need to do is skewer the shrimp on damp wooden skewers, cook on high heat for 4-6 minutes, and then coat in the creamy sauce once they’ve come off the grill. The sauce is simply a combination of sriracha, mayo, and sweet chili sauce. That’s all there is to it! Because the shrimp are allocated on medium skewers, they’re super easy to serve at summer barbeques and parties. I also love my grilled cilantro lime chicken skewers for that reason, too. Plus, they take literally minutes to make so they are simple to grill up once guests have arrived. Make sure to give the sauce a taste test before coating the shrimp. I found mine to be too mild so I kept adding more and more sriracha. You may want yours a little spicier, too. Don’t forget to soak the skewers in water for 30 minutes before adding the shrimp and grilling. It will keep the skewers from catching fire during the grilling process. Shrimp can taste rubbery when reheated so I don’t recommend making these ahead of time. They take very little time to cook so it won’t save much time anyway. There you have it – an amazing new grilling recipe to prepare this summer! Let me know how much you love it by commenting below. Grilled shrimp skewers covered in a spicy, creamy, sweet chili sauce. Perfect for the summer barbecues! Soak medium wooden skewers in water for 30 minutes before adding shrimp. Remove from water and dry on a paper towel. Preheat grill to high. Prepare sauce by whisking mayo, sweet chili sauce, and sriracha together. Set aside. Place shrimp on skewers until you have an inch on either end (mine fit about 3 shrimp per skewer). Brush shrimp with oil on both sides to keep from sticking to grill. Place on preheated grill and cook for 2-3 minutes per side, or until bright pink. Remove from grill. Brush each skewer of shrimp with bang bang sauce. Make sure to get both sides! Serve shrimp immediately, with extra sauce on the side. This post originally appeared on Julie’s Eats and Treats, where I am a regular contributor. It look simply amazing! Those shrimps are literally like a bang bang shrimp! Can’t wait to try! Thank for sharing. Thanks for this amazing recipe. I love it. It’s great. Good to cook when my hungry girlfriend comes home after a working day! The fast cooking before she will eat me! Yummy! So delicious. So easy and simple! My kind of recipe. These look so good!! I love shrimp! Yummmmm. I love shrimp, and I’m totally going to try this. I usually order this at the local restaurant, but now I can make it at home. Thanks! I LOVE bang bang shrimp! I was craving the tacos for awhile, but now I want the shrimp skewers you posted! 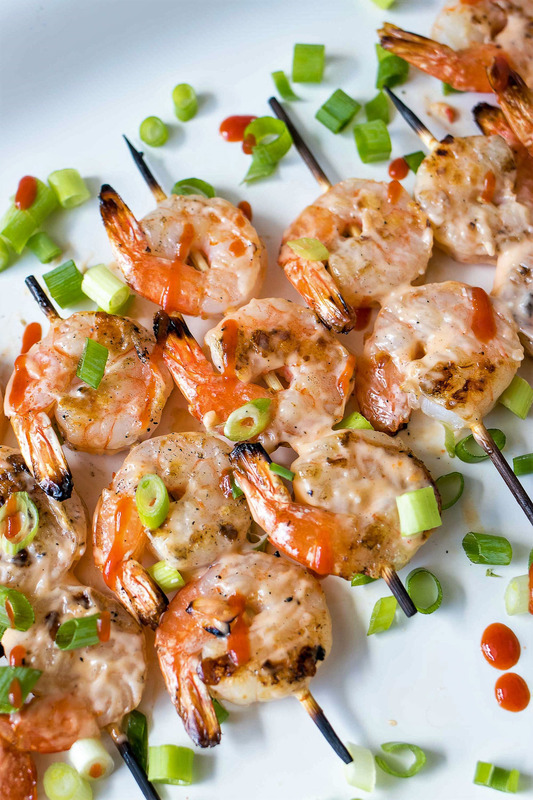 These shrimp skewers would be so perfect for an end-of-summer backyard BBQ! omg totally love how your recipe can be used for different kinds of foods! ingenious! My husband and I just got a new barbecue and we have been wanting to barbecue EVERYTHING! These look delicious and will definitely be on the menu next week! I can’t wait to try them! Yay!! We were exactly the same when we got a new grill! We love to grill in the summer, and always looking for new recipes. These look really good, I’m going to have to try this soon! I’m disappointed that we haven’t grilled more than a handful of times this summer so I’m going to share this recipe with my husband! I love this twist on Bang Bang Shrimp (without the breading)! Pinning for later. Yess! Hope you get a chance to try these out before the grill goes away! This shrimp recipe sounds so good! I have friends that will line up around the block for these, so I can’t wait to make them! OMG we have been grilling like crazy!! It’s our first summer as grill owners and we are loving it. These shrimp skewers look amazing. They are definitely going to our grill list! Yay! We’re in the same boat – we’re new at the grilling game since we got a house where we were allowed to have one. Let me know if you have any awesome grilling recipes that I gotta try! These sound phenomenal! My fiance loves shrimp, I can’t wait to make these for him! Yay! Let me know how he likes these! So easy and perfectly delicious! I think this is the perfect summer recipe for a busy weeknight dinner. Oh wow these look AMAZING! Can’t wait to use this recipe before the end of summer! !